Our good friends in Applecare alerted us to the fact that Lion USB keys were now available and in stock through AppleCare. 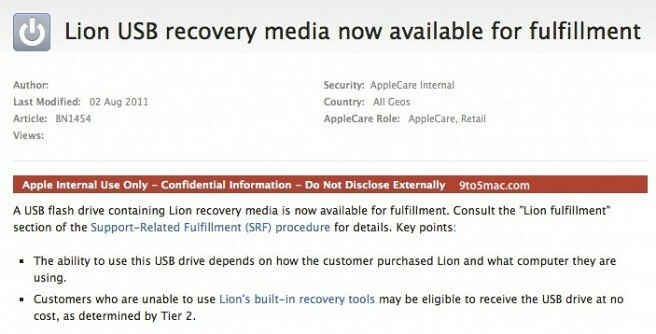 While officially they will cost a lofty $69, it appears, at least from the wording above, that some customers that aren’t able to use Lion’s recovery tools may be eligible to receive the USB drive at no cost. We’ve detailled how to make a Lion recovery key from a Snow Leopard Key (automated or on your own, cheap) so don’t put Apple though the hassle, OK? 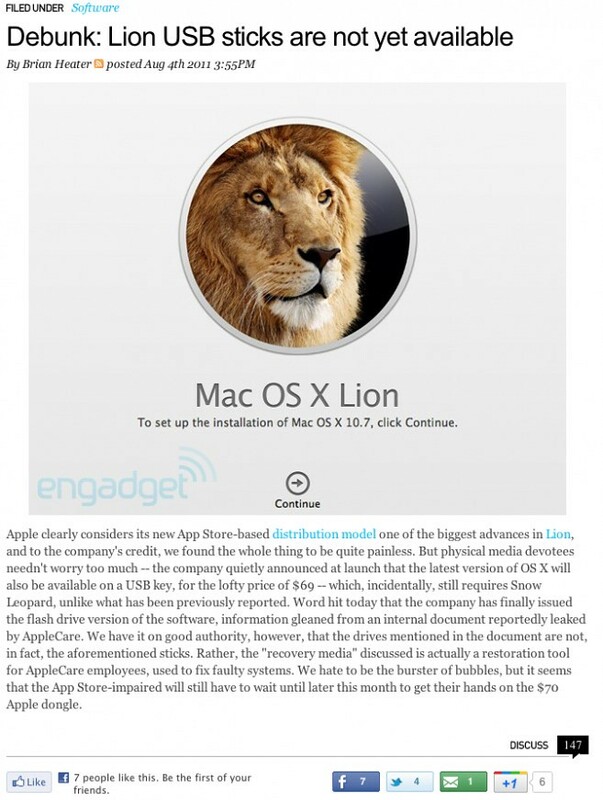 Update: We’ve been debunked by the new AOLEngadget! Head below for details. First of all, why not link to the original post to give your now confused readers some context? Even if you hate some sites, it shows you hate your readers more. But physical media devotees needn’t worry too much — the company quietly announced at launch that the latest version of OS X will also be available on a USB key, for the lofty price of $69 — which, incidentally, still requires Snow Leopard, unlike what has been previously reported. Really? What’s the point of physical media then? We can’t verify the Apple sticks will or won’t boot, but if they can’t, what’s the point? BTW, disks made from the Lion install DO boot, so its likely that this is strike#2. Also, how does one install Snow Leopard on one of the new Mac Minis or Airs that won’t take Snow Leopard? Rather, the “recovery media” discussed is actually a restoration tool for AppleCare employees, used to fix faulty systems. AppleCare employees are phone(!!) support. What good is physical media going to do them on the phone? Even Apple Store employees have LaCie drives at their disposal with at least three different Lion images on them so it isn’t clear why they’d want a slower USB disk as well. For verification, we called AppleCare and they verified the screenshot above. Lion USB sticks can be ordered now for delivery next week. By they way, good job watermarking your Lion Installer Screen. Jeez.